Florida's Gulf Coast reveals a succession of smart, year-round beach resorts, bristling with opportunities to enjoy the Sunshine State's glorious weather, its warm clear waters, and its sporty pursuits. 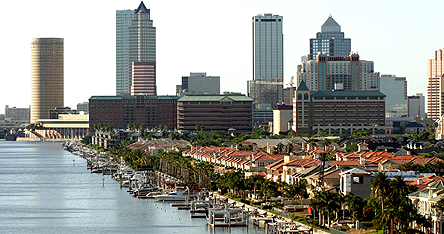 Tampa, the commercial hub, is a brisk, modern city, with a good range of shopping, entertainment and family-friendly activities and, in Ybor, a historic core with an engaging Hispanic heart (and great nightlife). At the Port of Tampa, you'll find a string of upscale restaurants and bars, and no shortage of pleasure cruisers ready to take you for a day trip into the Gulf. To the north of the city, the evergreen favourite, Busch Gardens, offers a day out with fun rides, shows and a zoo. But it's the coast's resorts, from Clearwater in the north, to Bradenton in the south, and the Gulf's narrow barrier islands (all an easy hop across Old Tampa Bay) where most holidays to Tampa are based. And it's here you'll find the coast's best beaches, and boardwalks lined with bars, boutiques, water-sports outfits and laid-back, family-style restaurants. If you're after another side of Florida to the hectic thrill rides and fun palaces of Orlando, Tampa and the Gulf is the perfect antidote. To enjoy the best of Tampa book a long haul lates summer holiday with Netflights.com.